I had planned my day to start quietly, just a short walk to the bus stop a five minute bus ride aund the corner then a walk to the new Starbucks that recently opened, a quiet coffee with my guide dog, Leif, a male black lab, sat at my side . Well, that was the plan and it all went to plan until it came time to leave the Starbucks. We rose from our table, we had sat outside as it was nice and cool for a California August morning, just about 68 degrees F. I took hold of Leif's harness and told him forward. We had not walked more than four paces from our table when there was a sudden growl from my right. Ok. another dog among the tables. The growl suddenly turned to a yappy bark and something hit my left knee and pushed into Leif's right side, about the point where his harness passes under his belly. There was a voice of a young woman to my right. "I'm so sorry! ", she said. 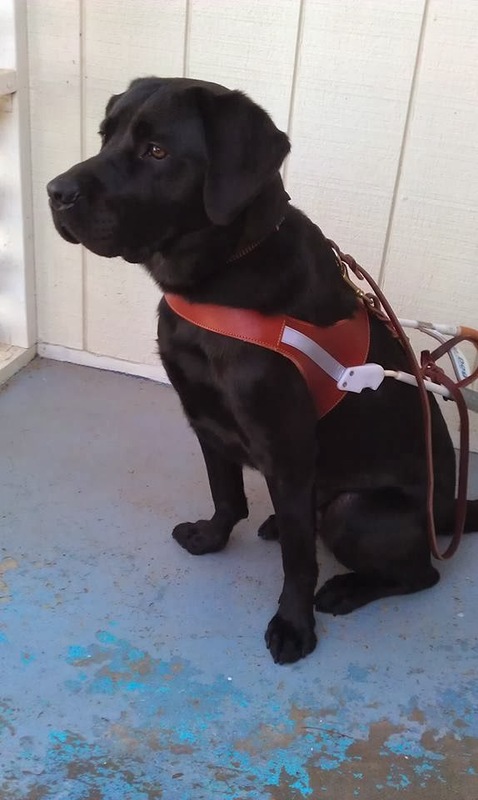 "This is my friends service dog, and she is so skittish." At this point I feel Leif's head jerk to the left as the other dog lunged at his face growling and yapping. "It's ok." I said. Thinking that it was not really ok but my dog was possibly in danger of being bitten. I tried to move Leif on around the corner out of the chairs. The young woman spoke again. "I am so so sorry. My friend needs this dog for her anxiety." "It's ok." I said again. By this point pushing Leif forward and around the corner as he tried to face the dog that was still growling. Finally we moved out of striking distance of this dog, shaken, I was upset, Leif looked over his shoulder several times as we walked away. This is the second time in just about one month that we have met these types of "service dogs". The other occassion I heard the dog, growling at a waitress in a diner, so took a long walk out of the building walking down a row of tables two aisles away. Today it came as a surprise. Of course being visually impaired as I am. I cannot identify the culprits. I did not see the dogs arrive and Leif showed no signs of being interested in another dog. When he is working he is generally good, but often wants to play with his guide dog friends at our California Council of the Blind monthly meetings. Today's incident however did give me two red flags on the recent spate of false service dog claims. First the young woman said that the dog was her friends service animal, for her friends anxiety. So why did this woman have the dog and not her friend? I know that I never let anyone take Leif away from me. Even now he is laying beside me, snoring in a deep sleep. The only times we have been seperated in almost three years is when I have been in hospital. The second red flag was the statement that the dog was "skittish". A dog that is skittish should not be even allowed to pass basic training for a service animal should it? I know if Leif behaved in this manner I would be suffering anxiety because of my continuous worrying that he might attack a person or another dog. I know dogs do not know a service animals insignia but calm and sedate would be wise for any servicee animal. So was this really a service animal? I will never really know. I have my doubts but I cannot swear that it was not. Was the young woman it's owner? Again I will never know. The good news is that Leif doesn't seem to have been injured, no blood, no long lasting anxiety. I though have the anxiety that we may yet have other such encounters and that one day it WILL be a more serious attack. I need to learn to relax and not worry. But I do worry over my pal. He does a lot of good work for me and I trust him with my life every time we leave the house. It would be a very sad day for me if an attack such as that today, was the last memory I had of working with a guide dog.